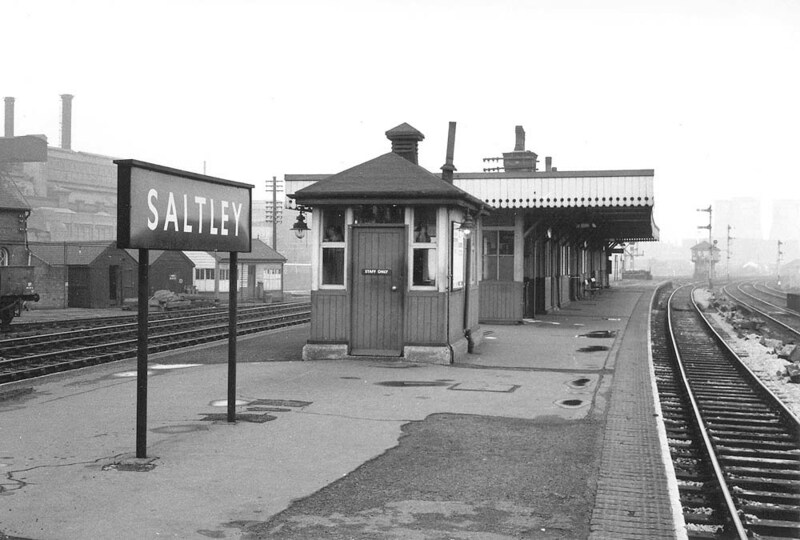 Looking towards Water Orton along Saltley station's down platform with Saltley Sidings Signal Box and adjacent sidings in the distance. The island platform was well equipped with waiting rooms and booking office reflecting the usefulness of the station in the late 19th century when it was rebuilt to accommodate a much higher level of usage. The station building was built to the LNWR's late 19th century design using prefabricated timber panels and the roof and canopy being an integral unit. As was common with many stations near to the centre of Birmingham, the development of public transport in the post-World War One period in the form of buses and trams led to the decline of the station as services were not as frequent or as convenient. To the right of the platform the bridge carrying the lines over the canal can be seen whilst the nearby canal wharf and reservoir was to be found behind the buildings seen on the left and beyond the running line by about 150 yards.